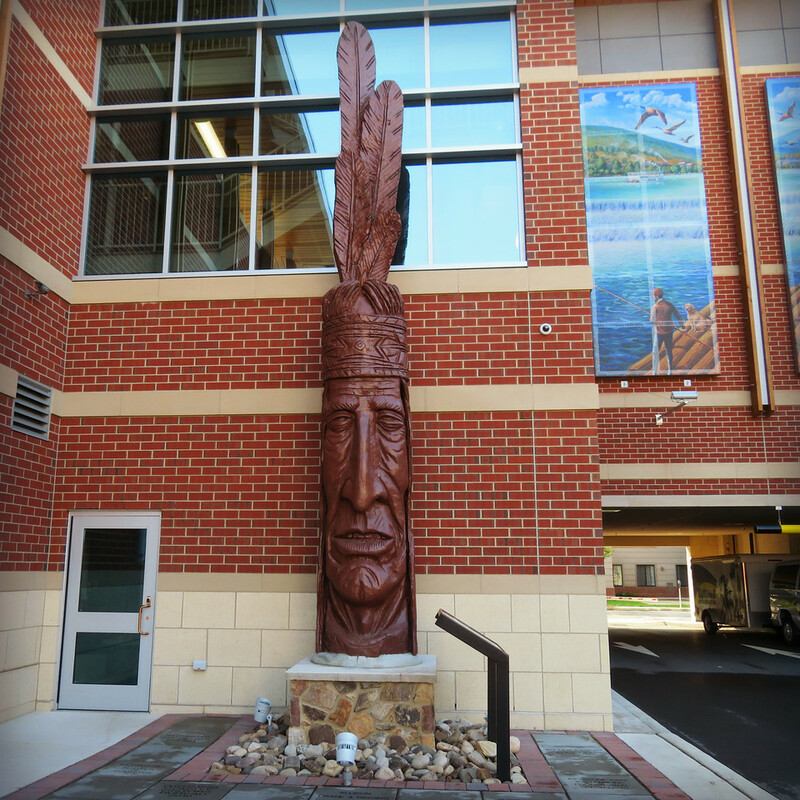 Last week I stopped in the town of Williamsport, Pennsylvania to see the Whispering Giant, Chief Woapalanne. 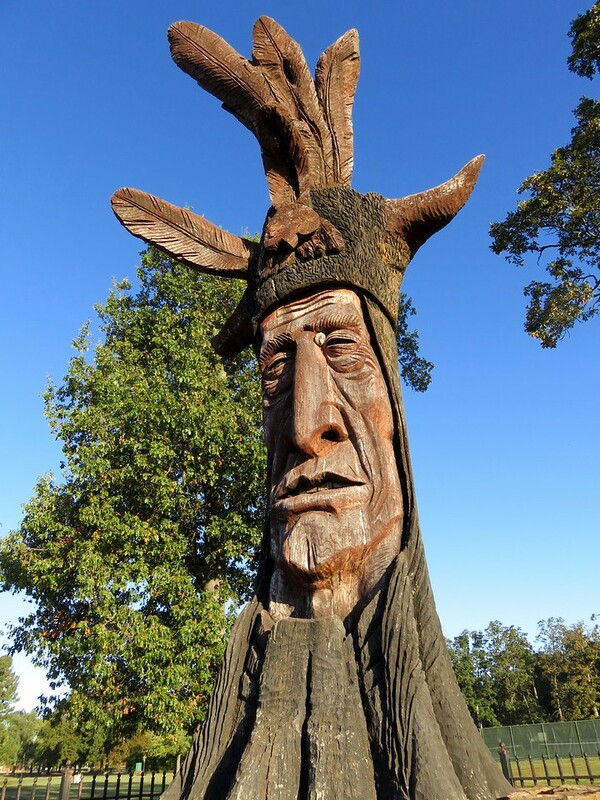 Though he was taken out of commission from his original perch in the summer of 2015 due to rot, a rescue effort was mounted and the Giant was restored. Following a tweet from the Taber Museum, I knew he was there somewhere at the bus station. The bus terminal does not allow car traffic to pass through, so I couldn’t even get a good look at the Google Maps Streetview to try to zero in on just where it might be located. I didn’t know if he was outside or placed inside the terminal somewhere. After circling the block 3 or 4 times with nothing to show for it, I pulled into the municipal parking lot figuring I’d have to walk inside the bus terminal. As I pulled into a parking space, I saw the Chief’s feathers rising up from the corner of the terminal. 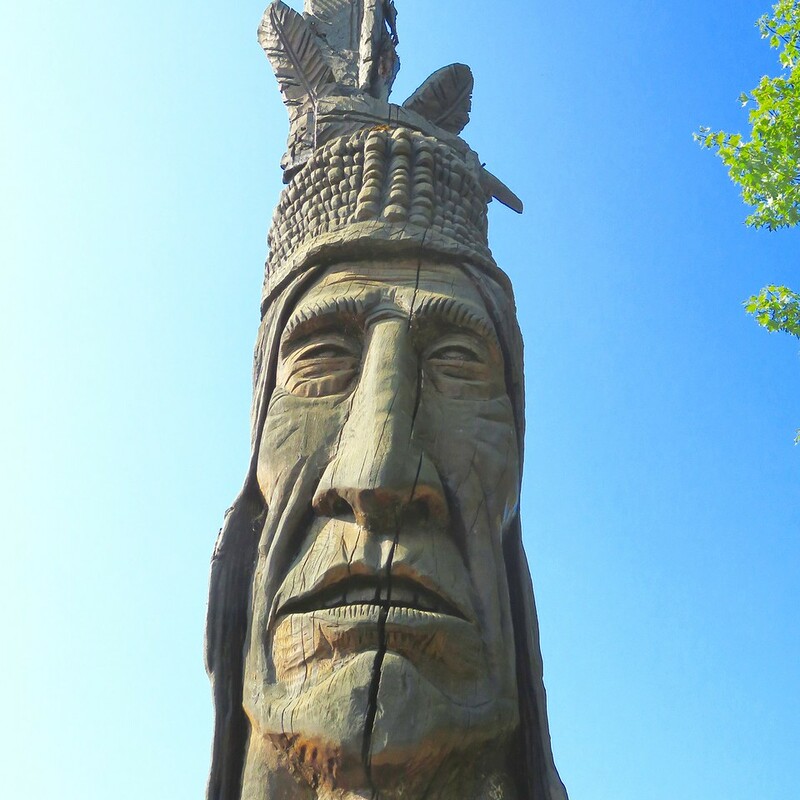 Whispering Giant Chief Woapalanne lives! If you click the image below, you’ll see a full-sized pic in which you can read about the Giant’s restoration process. The most noticeable changes are that he was shortened by three feet, removing the rotten base and he is now wearing a dark stain. He is lovely. It warms my heart to think that people cared enough to save this Giant. If you’re interested in visiting him, the parking area on William and W. Willow will give you easy access. Looking on Google Maps, this would be the location of the statue. In 2015, I took part in the Team Strange Whispering Giants Grand Tour. 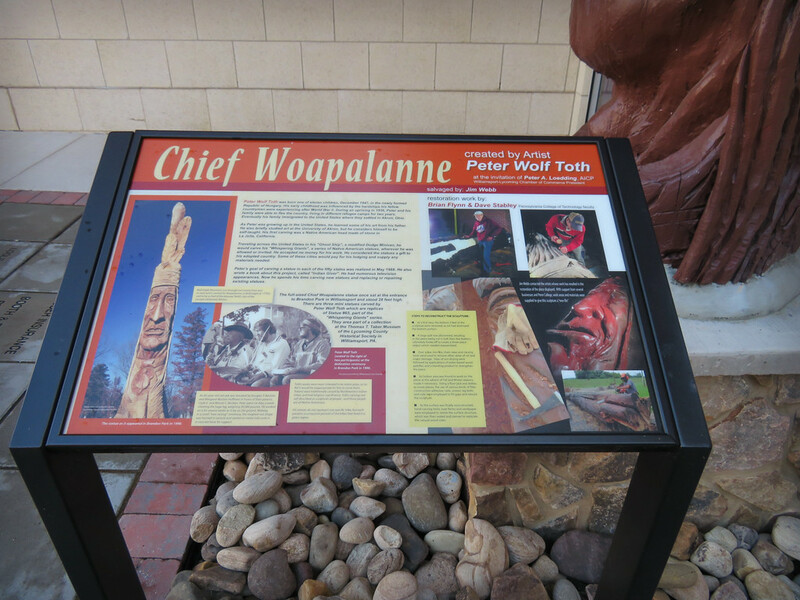 The tour brought riders around the country to visit Peter Wolf Toth‘s beautifully carved statues depicting local Native Americans. 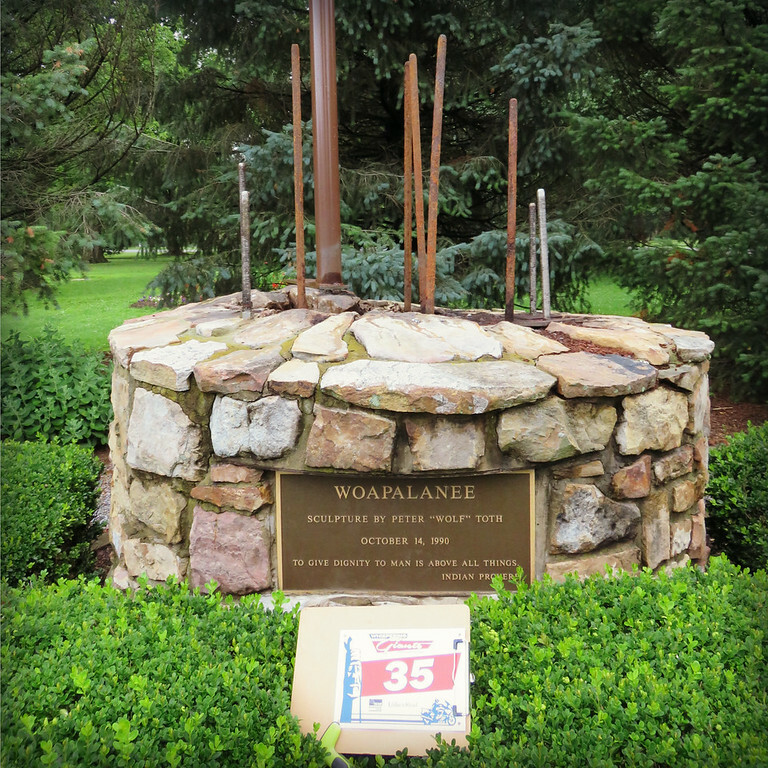 When I reached Williamsport, Pennsylvania in July 2015 to visit the Giant Woapalanee that was installed in the park, I was disappointed to find that he was missing. All that was left was a pedestal and a plaque. As it turned out, I’d missed him by just a few weeks. But, what happened to him? Would he be back? Looking around the web, it became clear that the Giant had suffered extensive interior damage. Ultimately, it was dangerous to leave him in place because he might collapse. 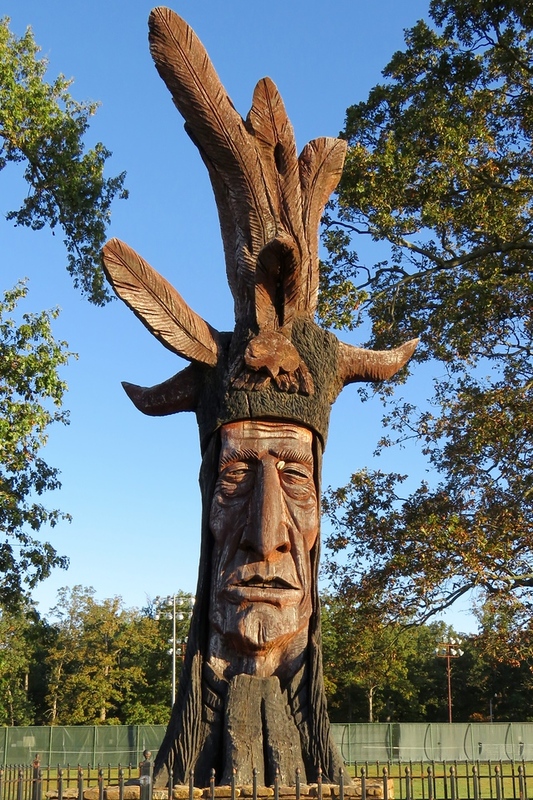 Though the carving was a well-loved town fixture, it ended up in a mulch pile with no immediate plans for repair. That is until this guy stepped in to save him. 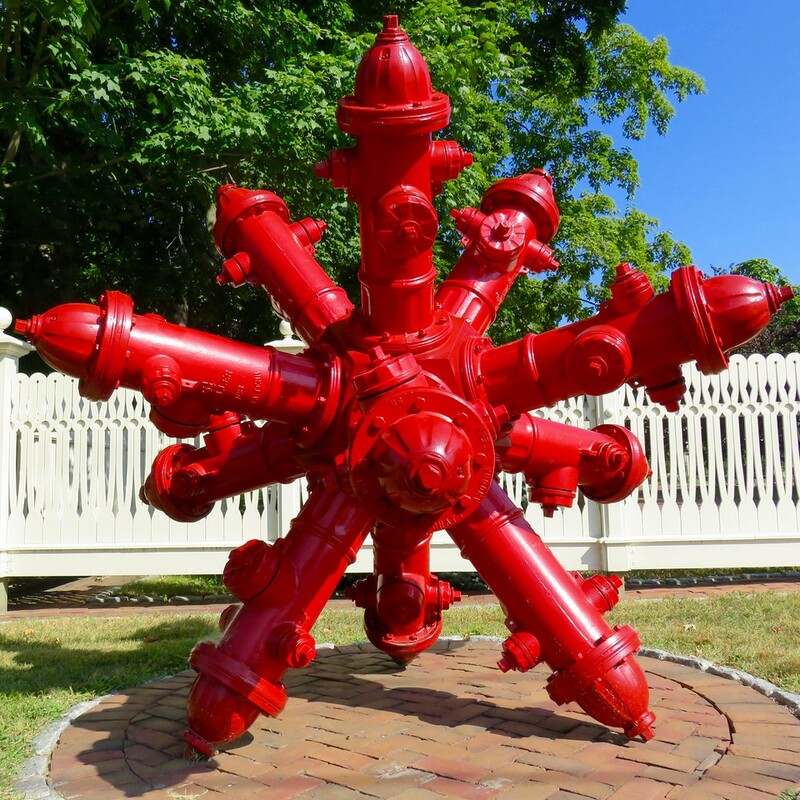 Based on that post, I took a look at the Thomas Taber Museum website. I thought for sure that such a grand piece of artwork would be prominently displayed. My giddy hopefulness quickly fizzled. Though there were 3 nicely carved small Woapolanee pieces, there was no Whispering Giant anywhere on the museum’s site. No. Just a model. The original is at the wmpt bus station. You’ll probably think I’m ridiculous, but I actually woohoo-ed when I read the reply. 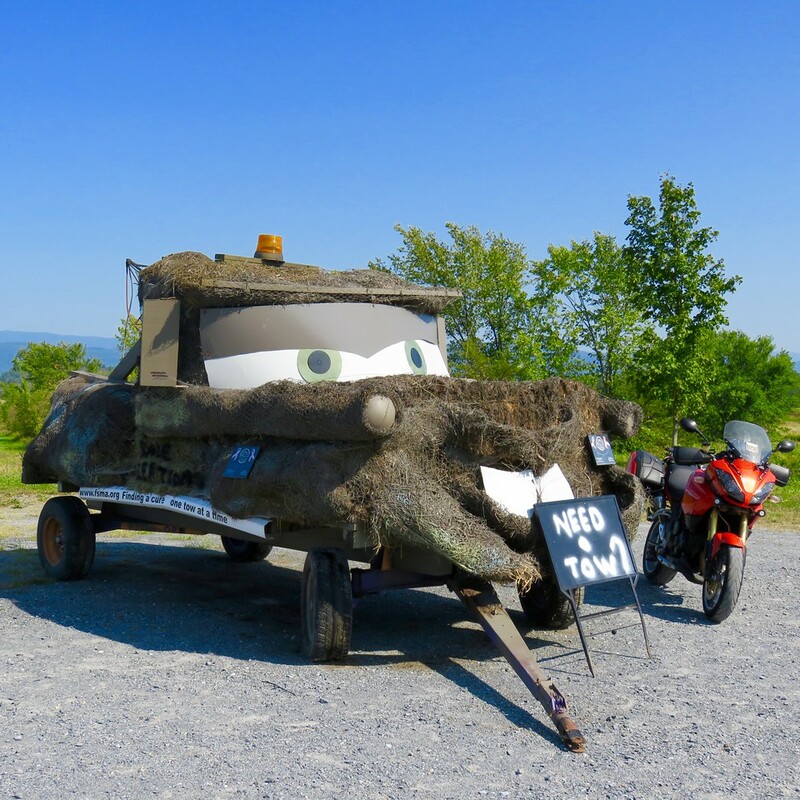 Firstly, I’m happy to know that there were people in Williamsport who cared enough to keep Woapalanee from being termite-chow and returning to the Earth. Perhaps that is ultimately the wooden carving’s rightful, natural place, but selfishly, I want the work to live, to inspire and to be enjoyed. Secondly, and I hadn’t considered this before, but I deeply appreciate the people out there in the world who take the time to write down their experiences. Without this man writing about everyday goings-on in Williamsport, I would’ve had no idea where to look for information about the missing Giant. Some people may write off personal blogging as useless time-filler about what you ate for lunch but, the people who do it, whether they know it or not, contribute to documenting contemporary life. I’m going to try to remember that when I feel like people on the other side of my blog are rolling their eyes at the stuff I stop and take photographs of. If just one person finds it useful – be it for a laugh, inspiration or something else, then I will have done something good. Now… I’ve got to go see about a Giant! When I pulled up at the edge of Noble Park in Paducah the word “Wow,” escaped from me. Even though it was the 10th Whispering Giant I visited, I didn’t expect how striking his appearance would be in person. Having seen Wacinton in photos from other grand-tourers I knew that I had to see him, too. His sheer size is powerful. 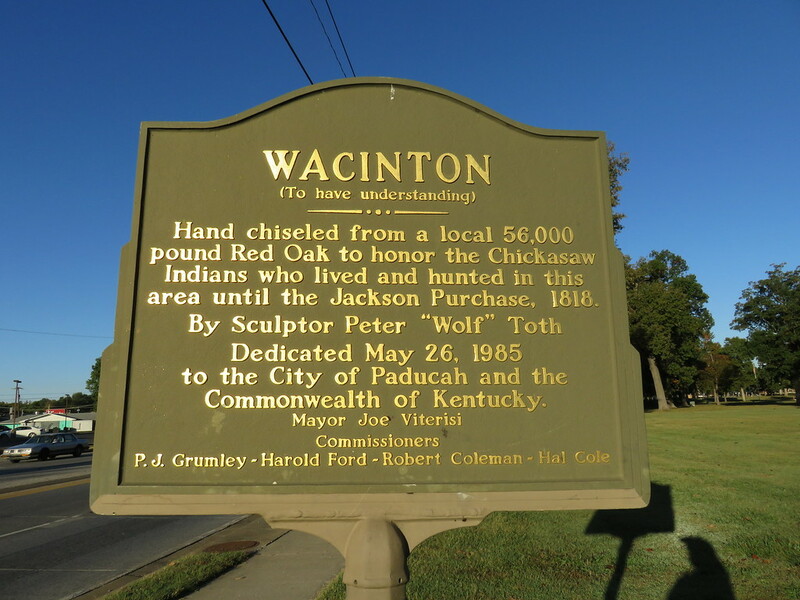 Wacinton stands 35 feet tall to the top of his feathers. The wood appeared in good condition with no immediate signs of rot but there were several beehives attached. Other photos around the web show the Giant as having deep stained coloring but the sun and weather has faded it a bit. I can officially say that this was my favorite Whispering Giant, unseating Rotaynah. 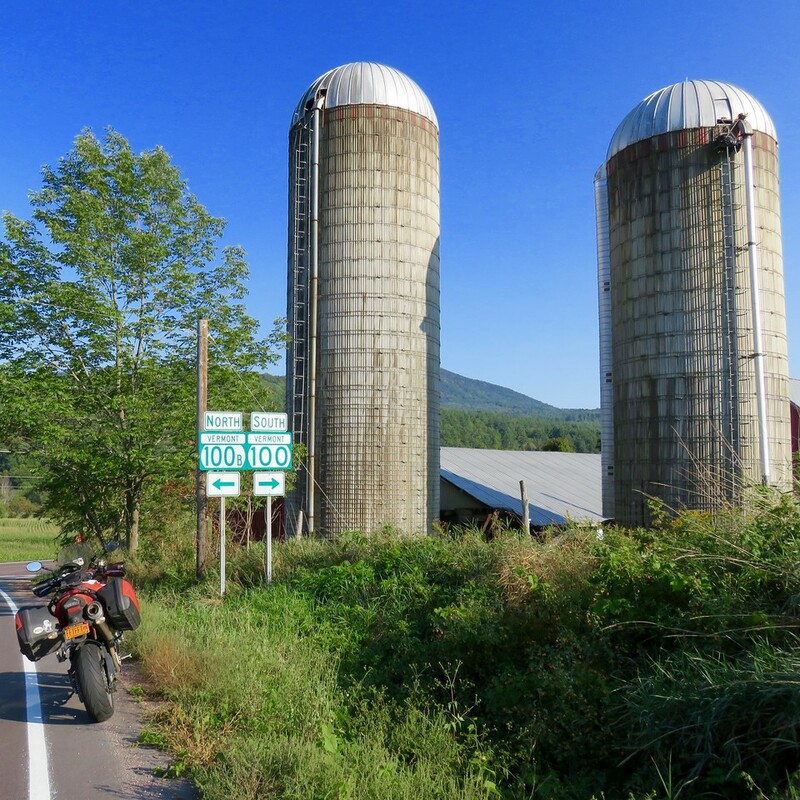 Though I am sure I will visit others in my travels in the future, the Team Strange Whispering Giant Grand Tour will come to a close on October 31st. It has been a great experience visiting these beautiful carvings and reading their stories.